Adams, S.T. (2005). A Strategy for Technology Training As Part of a Master’s Program Conducted at a School Site. 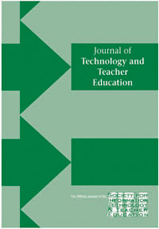 Journal of Technology and Teacher Education, 13 (3), 493-514. Norfolk, VA: Society for Information Technology & Teacher Education. Retrieved April 25, 2019 from https://www.learntechlib.org/primary/p/5075/.